I hang my head in shame. I bumped this book up on my to-read list. I’ve had just the most amazing streak of incredible books lately that I wasn’t ready to test the waters this weekend. I wanted an author I trusted; one I felt confident could take me someplace full of adventure with a group of characters I could enjoy. Of course, White did not disappoint. I’ve said it in every review I’ve done for one of his books: I love his writing. It’s easy to follow, but not dumbed down, and there’s guaranteed to be at least one character to entertain me. In this book it was Thaddeus and Lynette. Now, to keep confusion down, I will refer to the author as White since there is a character in the book named Thaddeus, which happens to be my favorite. 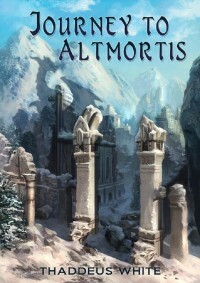 Unlike Bane of Souls, this book takes us on a journey (ha… fits the title nicely) to the lost city of Altmortis. The group of characters we go on our adventure with are entertaining and diverse. I have quite a few I liked in this book, but Thaddeus was by far my favorite, for me anyways. He has a likable quality without being overly “good.” An odd thing to say, I know, but it’s the truth. I’ve never been so fond of a thief before, and he has no intention of cleaning up his act. Again, a realistic character that is likable and one you could imagine yourself sitting at a bar with while drinking and laughing away the hours. I also enjoyed the character of Fritigern quite a bit. Pretty Pierre was another great one. And Anja. Oh hell, I enjoyed them all! That was in the first chapter. Love it. The places we traveled to were described wonderfully and immersed me in the scene with all my senses firing away. It was different from Bane of Souls but, for me, in a good way. This moved along with much less history and kept my attention throughout. To conclude my ramblings, I’d highly recommend this book to anyone who enjoys a good fantasy. You don’t have to read Bane of Souls first, though I do recommend it. And if you haven’t done so, pick up Sir Edric’s Temple. It’s still my favorite of White’s work, though this gave it a run for its money. I’m anxiously awaiting his next book, regardless of the world it is set in. Huzzah! I’m glad for any review, and especially happy you enjoyed Journey to Altmortis so much. I made a few changes based on reviews of Bane of Souls (faster start, bit less description) which seems to have generally gone down well. Well, there were a few nail trimmings when they were in the ruins, but the nail that met its end did so when Thaddeus, Fritigern, Pretty and the other guy (can’t remember his name off the top of my head) were cornered by the… I’ll say creatures so I don’t spoil it. You cut the scene and my reading turned quite frantic at that moment. As I said, Thaddeus was my favorite and I didn’t like seeing him in such horrible danger. I think I’ll get the updated Bane of Souls and read it again sometime. I’ve got a better handle on the world and I like how you tied some stuff in, but not so much that they can’t be enjoyed separately. But I’ve been reading Sir Edric again when I have a few free moments. Have I mentioned how much I love that book? I even bought as a gift for my mother. I hope your mother enjoys it. A friend of mine re-read Sir Edric’s Temple and said he found a few amusing bits he’d missed before. I think I put some in by accident (might be the odd moment of mounting Hamilton’s Trousers, or stroking Hamilton’s Trousers). Been working on the first chapter of the next Sir Edric outing, currently entitled Sir Edric’s Treasure. Kingdom Asunder’s much further along, but will take a lot longer to write, so I’m not sure which will be ready first (and I might bundle Treasure with another Sir Edric story).